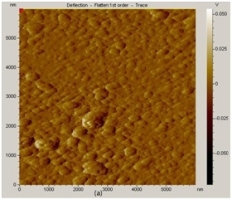 Conductive pervoskite BaPbO3 (BPO) films as potential electrodes for ferroelectric / tuneable applications are prepared by pulsed laser deposition technique. XRD and standard four probe method are employed to investigate the dependence of growth conditions on crystal structure and resistivity of the BPO thin films. The target to substrate distance was kept at 45 mm and the target was kept in rotation during deposition. The films were prepared on fused silica substrates. The substrate temperature, oxygen partial pressure was optimised to have crystalline conducting films. The lattice constant of the BPO thin films from the XRD data is found to be 4.26 Å for optimum processing conditions. Smooth crystalline films with low resistivity of the order of 23 mΩcm were obtained at oxygen pressure of 0.86 mbar and a substrate temperature of 650°C. The oxygen pressure and substrate temperature are important factors that influence the growth of BPO thin films which can be fabricated as electrodes for ferroelectric/tuneable devices.